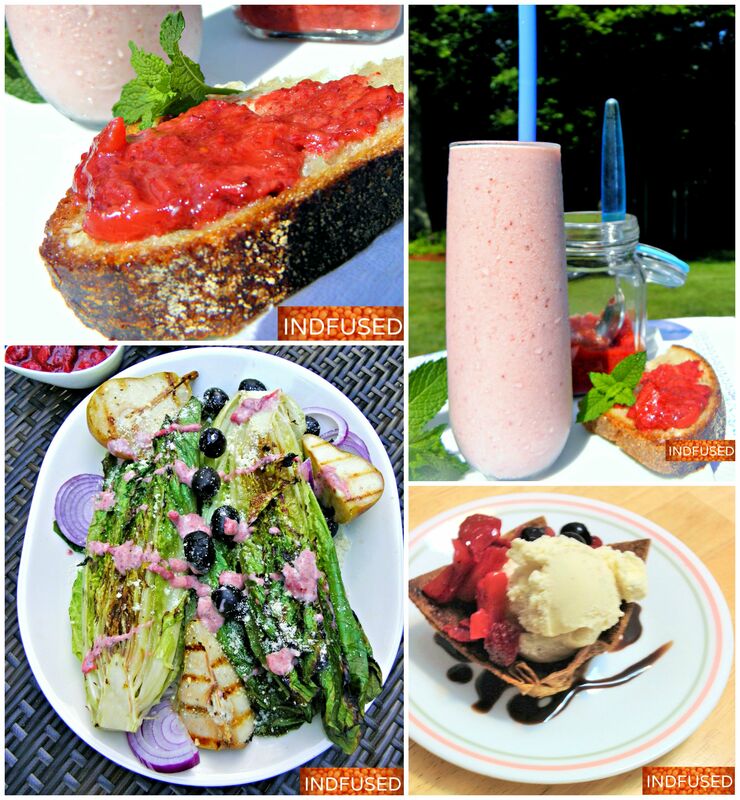 Multi purpose Strawberry Ginger Chutney used in a variety of dishes from breakfast to dessert! Versatile is what describes this chutney accurately. When I made it, I did not even realize that I would use it in so many ways. And I have a list of so many more sandwiches, wraps and salads that I would use it in! Strawberries are in season now, and I go overboard when I buy them. After one such trip to the market, I decided to make a simple strawberry chutney. This healthy recipe has honey, chia seed, green chili and ginger that complement the strawberries perfectly and the chutney takes only 8 minutes to cook! My jar is almost empty now after I used it for strawberry lassi, as a salad dressing, on buttered toast, in chicken salad wraps, my favorite avocado cheese sandwich and even on vanilla ice cream! For the lassi, I simply whisked about 2 heaped teaspoons of the chutney with my home made yogurt. I like to leave the strawberries a little chunky and they paired very well with my grilled romaine salad with grilled pears, olives, red onion and parmesan cheese. I whisked the chutney again with the plain yogurt for a lighter version of the salad dressing. The strawberry chutney can also be whisked with balsamic vinegar and extra virgin olive oil for another take on the salad dressing. 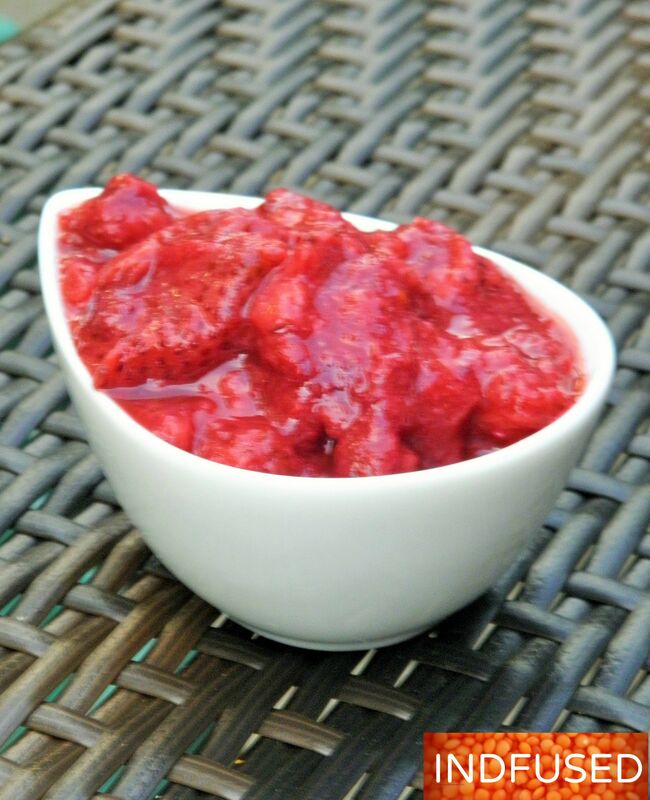 The freshness of the strawberries comes through in this quick and easy recipe for homemade strawberry chutney that is tangy and sweet and laced with the delectable fragrance and taste of ginger and a hint of the green chili spice. The bonus is the health benefits of all the ingredients! Combine the strawberries, honey, ginger, the serrano pepper (if using) and the salt in a pan. Let it cook over medium heat for about 6 minutes.You will see the color change and deepen. The Strawberry chutney at the beginning, after 6 minutes and after 8 minutes! Done! Add the chia seed powder and cook for another 2 minutes or until the desired consistency is reached. The chutney will thicken a little more as it cools. Your multi-purpose, strawberry chutney with ginger and chia seed is now ready! Enjoy it in many different ways! I just wrote this down. It sounds so delicious! I have to try this! Thank you Lynn! Do let me know how you like it! That chutney wouldn’t last long around here! The lassi looks delicious. I love the taste of hot chili peppers paired with sweetness. I have not made it with raspberries, but I think it will taste great! You always come up with some great, unusual pairings Sandhya. Who’d have thought to pair strawberries and ginger and serrano peppers? But it sounds wonderful, I like ginger in anything. I’ve never come across chia powder? I do use chia seeds in my oatmeal every morning though. Beautiful photos, you’ve shown us great ways to use that delicious chutney. Thanks for sharing. Thank you so much Loretta! Your sweet words of encouragement keep me motivated! I found chia powder at Whole Foods. Love this colored chutney,looks so tempting and delicious….